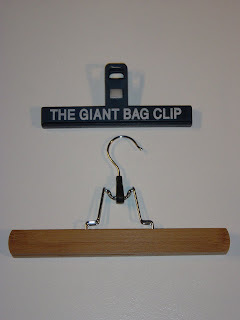 What does this chip bag clip and this pant hanger have in common? and they do...Do you get annoyed when you are reading the instructions in a quilt book and the pages keep flipping closed? Well, just find a large chip clip or pant hanger. This particular pant hanger is the kind that you fold back the hook and the 2 wooded slats open up. Just place over the book and hinge it closed again. The tight grip keeps the book from closing. 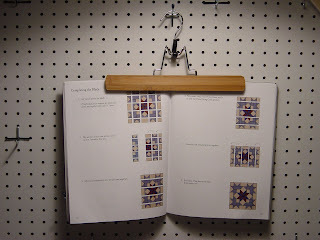 Now you can use the hook to hang up the book where ever you are working. You can hang it over the cutting table when you are reading the cutting instructions, because if your table looks like mine during a project, the book usually gets buried. This way it will always be ready for you. 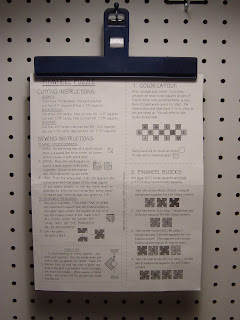 It's also good to hang near your sewing machine when you are piecing blocks and need to look at the instructions or fabric placement. 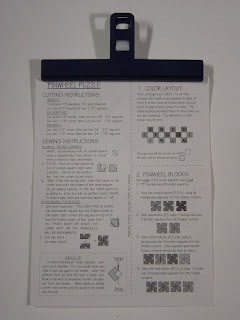 You can use the chip clip for pattern sheets, light weight patterns or booklets. The chip clip may not be strong enough to hold a book like the pant hanger does. Just hang it where ever you're working! 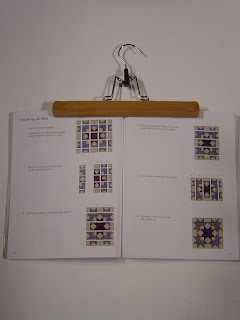 Hope this helps to keep your quilt books open, but don't forget to use it with cookbooks too. This week is going to be crazy...work, doctor's appointments, school fundraisers, junior prom and Courtney is finishing up her senior project (Underground Railroad Quilt). I'll try to keep up with everyone's blog, commenting and emails, but it might take me a while. I can't wait for Sunday, I think the calendar is empty! Love your Tool Time Tuesdays! And especially love today's tip! I just bought a bunch of pants hangers at the thrift shop not long ago. Never thought of this use for them, but it's one I can *really* use. Thanks so much. This is a great idea! Thanks! And take a deep breath and dive in for the rest of your week! Sounds very full-on and exciting! Gosh you've got a busy week! I know the feeling!! I've just caught up on the last month of your posts (for some reason they didn't appear on my bloglines). Love your tooltime tuesdays and your trip to Disney sounded such fun! Another great idea. I use pants hangers a lot......to hold wall-hangings that are not in use and I keep them in a closet in the guest bedroom. I can fit a lot of them in there and get to them easily! Love your Tuesday "features". Tuesdays with you is my latest addiction! Thanks for all you share. Great tool tip again. Thanks! What great ideas as usual!!! And it sounds like you have a week like mine! Now, if I could just get the prom dress finished!!! Those clips can also be used for pressed strips of fabric, quilt tops that are nicely pressed and waiting to be quilted....ask me how I know. :-) You have a busy week...get to it! YOu come up with the greatest ideas! I love it! Now, if I had a wall that I could hang it on, it wouldn't get lost!LOL! Another great idea.I hope you never run out of them.Thanks for sharing them. How do you think of theses things!!! I think the school part of May is the worst, so very, very, busy. Hang in there! Karen...as always, I love your ideas! When I used to sew lots of clothes and dresses for my daughters I used to take thumb tacks and tack to the wall so I could keep track of where it was. this is much nicer! Thank you so much for sharing! Once again, great idea! Hang in there this week! So clever!!! And I won't forget the cook book! Hope your Sunday is a relaxing and lovely one! And then when your kids need their piano book propped open !? .... this would work there too! I love this. Just love this. Thanks for your terrific ideas, Karen! Great Idea, thanks for sharing. Will need to go and search out these items. My goodness, you are so creative. I hope you don't run out of ideas for TTT, for a long time, because I'm hooked. I still have to make your car caddy, sewing organizer.